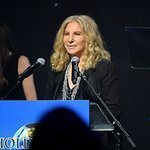 Sunday’s (May 22) Backstage at the Geffen, star-studded fundraiser at the Geffen Playhouse and the pre-show host committee dinner grossed over $1.4 million for the Geffen Playhouse’s education, outreach and artistic initiatives. Norman Lear presented the Distinction in Service Award to social entrepreneur Jeff Skoll. Walt Disney Studios Chairman Alan Horn presented the Distinction in Theater Award to Oscar-winning actor Morgan Freeman. Actress Dana Delany, a Geffen Playhouse alum, served as Master of Ceremonies for the by-invitation-only fundraiser that gathers superstars from the worlds of stage and screen to share often irreverent, behind-the-curtain stories of the struggles and surprises that memorably shaped their lives and careers. This year’s 14th annual fundraiser featured “backstage” memories by Rainn Wilson, Aaron Sorkin, Garry Marshall, Kristin Davis, Amy Landecker and Jaeden Lieberher with musical performances by Ellis Hall, Frenchie Davis and Jon Boogz & Lil’ Buck. David Geffen served as Honorary Chair of the 20th Anniversary event. Martha Henderson and Pamela Robinson Co-Chair the Geffen Playhouse Board of Directors. The evening was beautifully produced by Gil Cates, Jr. and Kevin S. Bright and directed by Randall Arney. Funds raised are earmarked for a host of Geffen Playhouse endeavors including new play development, playwright commissions, second productions and artistic risks, as well as the theater’s award-winning education and community engagement programs, which help bring the excitement of live theater to more than 15,000 disadvantaged youth, seniors, veteran and community members annually. 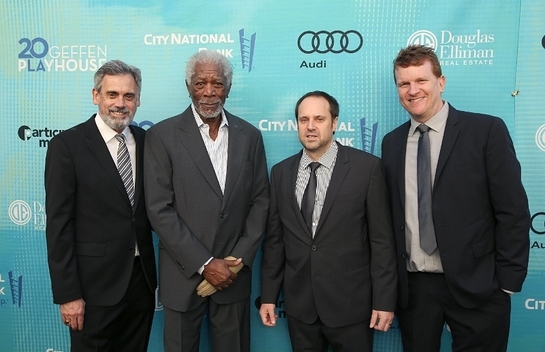 Backstage at the Geffen title sponsor City National Bank, returning for the seventh year, was joined by presenting sponsors Audi of America, returning for the 11th year, Apollo Jets, Douglas Elliman Real Estate and Participant Media, with special thanks to UCLA and CAA. •	The curtain rose to “Ambassador of Soul” Ellis Hall performing Seasons of Love from Rent, accompanied by a nine-member choir, while images representing 20 years at the Geffen, were projected in the background. •	‘Why I Love the Theater: Kristin Davis recalled a story about how Angela Lansbury saved her when she reached for a line she forgot. Apologizing afterwards, the veteran actress graciously replied that, “Everybody forgets their lines.” “She was so generous,” said Davis, "Something always goes wrong and the person who saves you is usually another actor. That’s why I love the theater." •	Lucky Lunch Break: Young actor Jaeden Lieberher appeared in St. Vincent with Bill Murray, who intimidated him until he found out that Murray didn’t really like kids. Yet during a press tour, they wound up as pals when Murray spirited him and fellow cast mates Melissa McCarthy and Naomi Watts away for a half-hour lunch that stretched to two and a half hours, keeping an impatient press corps waiting. •	Spoken Word: Jon Boogz, Lil’ Buck and dancers performed an interpretive dance to a spoken word piece by Robin Sanders inspired by the evening. •	There’s No Place Like Home: Broadway performer Frenchie Davis sang “Home,” from The Wiz, a song whose message encapsulates what many actors, donors and patrons feel about the Geffen—that it’s truly their home. •	Arriving in Style: Guests were greeted at the entrance by a 2016 Audi R8 Vio Spyder. Stunning, agile and possessing unrivaled power and performance. •	Dining With The Stars: Host Committee guests and honorees enjoyed a pre-show dinner catered by 2016 James Beard winning Chef Suzanne Goin of Lucques with wines provided by Sterling Vineyards. •	Sweet Ending: A post-show reception featured an array of luscious desserts from Ronen Levy, Richard Ruskell, Sprinkles Cupcakes, DeLuscious Cookies, The Dessert Tree, Bo Nuage and Kakigori Kreamery.